To add a new resource-based service, click the Add icon ( ) in the applicable box on the Service Manager page. Enter the required configuration settings, then click Add. To edit a resource-based service, click the Edit icon ( ) at the right of the service. Edit the service settings, then click Save to save your changes. To delete a resource-based service, click the Delete icon ( ) at the right of the service. Deleting a service also deletes all of the policies for that service. How to add a service to HDFS. 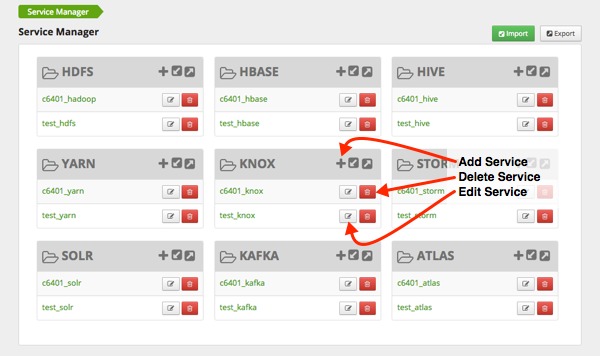 How to add a service to Knox. How to add a service to Solr. How to add a service to YARN. How to add a service to Atlas.